We’re just about at the end of World Watercolor Month! WHEEE! But we aren’t done yet….2 more days! 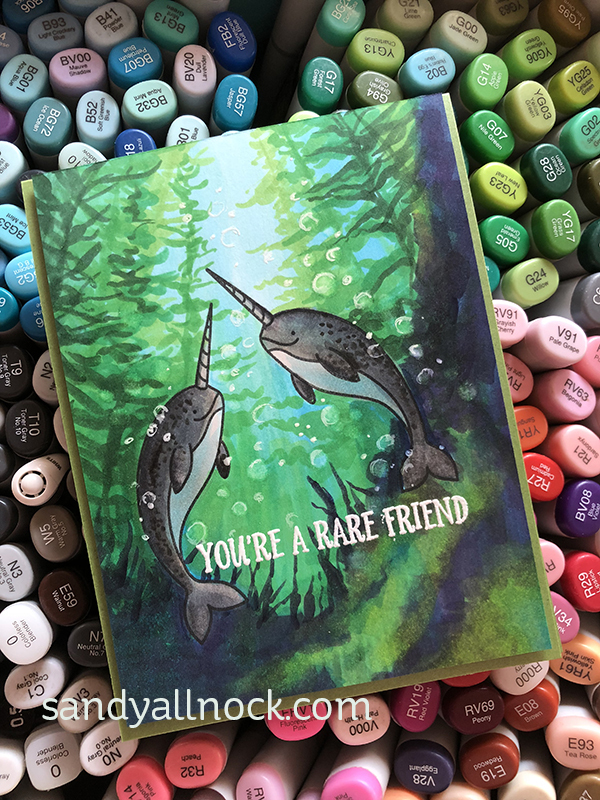 I’ve seen lots of narwhals colored in bright happy colors….not so much in realistic colors! I looked at lots of pictures on Google, and gave it a try with Distress inks. Hope you’ll try something like this at some point! It’s lots of fun. Watch the video below or click HERE to see it in HD on YouTube. 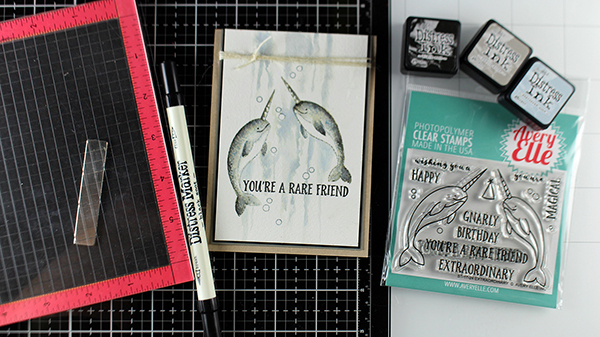 To finish off the card, I used grey and kraft and black cardstock layers, and just a little twine. Wow!! Sandy can do it all. 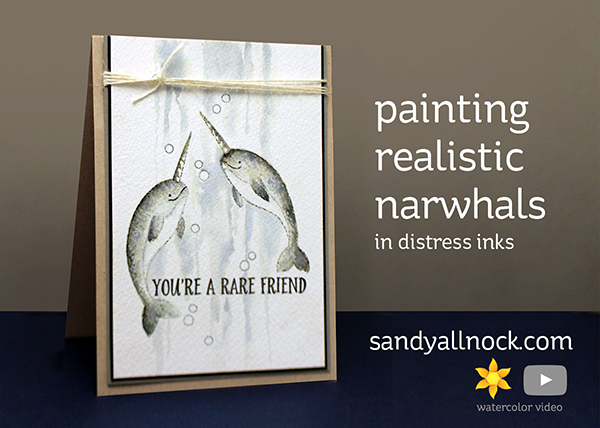 Hi Sandy – thanks so much for the comment about having enough so you don’t panic. I do that with all my go-to’s…particularly substrates! I enjoy your videos so much and I am getting so much out of your Copic Jumpstart class! Thank you for sharing your talent, thoughts, and inspiration! Lovely cards – well done! Great to see how watercolor with Distress Ink. I love it, the Narwhals are so realistic! Oh these are wonderful! I love the video and they turned out so well. Such a pretty card. Thanks for sharing. 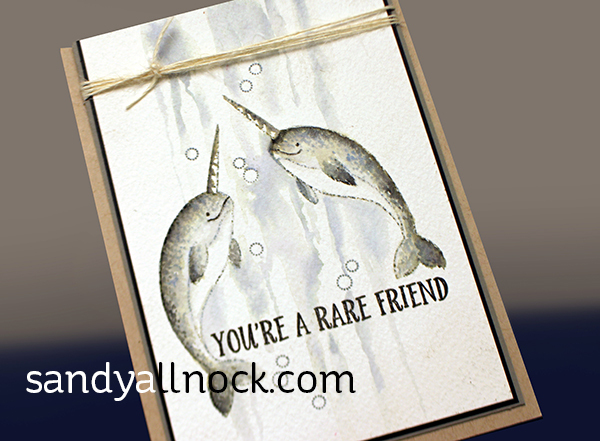 Great video, super cool narwhals, nice to see them in natural colours & in a scene, thanks. P.S. Although I do like them in purples like another card designer did.